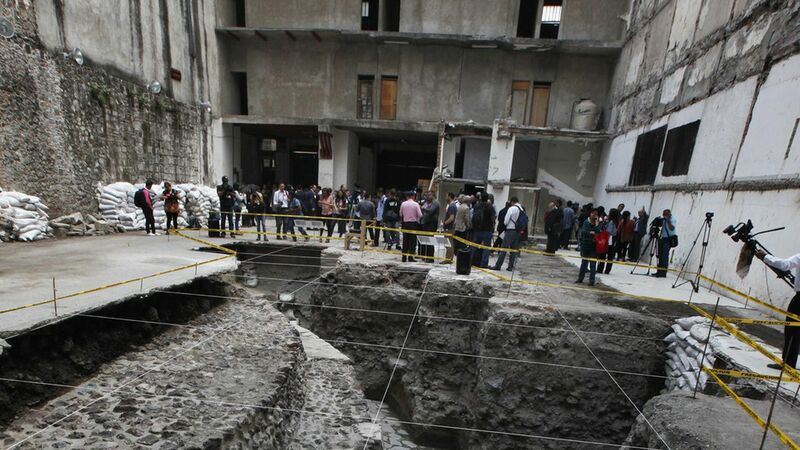 Archeologists have discovered that the remains of a temple dedicated to Aztec wind god Ehecatl were buried beneath the grounds of a 1950s-era hotel down a small side street in Mexico City near the Templo Mayor, another major Aztec ruin, reports The New York Times. What they found: The Archeologists, who began digging in 2009, found the base of a huge circular temple and a section of a ceremonial ball court that was built during the 1482-1502 reign of Aztec emperor Ahuizotl. They also found a pile of 32 vertebrae from a severed male neck, which the NYT notes was "probably sacrifices linked to the Aztec ballgame."